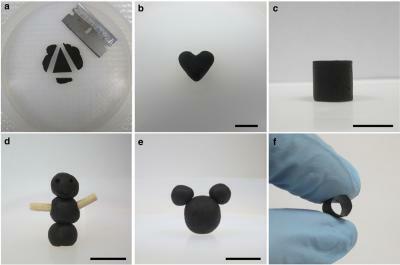 Researchers from Northwestern University have turned graphene oxide (GO) into a soft, moldable and kneadable "play dough" that can be shaped and reshaped into free-standing, three-dimensional structures. Huang explained that a shipment of 5 kilograms of graphene oxide, which currently would have to be dispersed in around 500 liters of liquid, would have to be delivered in a truck. In contrast, the same amount of graphene oxide in dough form would weigh about 10 kilograms - much lighter and easier to transport. This could turn graphene-based sheets into a widely accessible, readily usable engineering material.